I’m afraid of pandas. Don’t laugh, it’s the truth. Oh, they may look cute and cuddly, they may seem soft and soppy, but they are, in actual fact, cruel and creepy. They are evil. I don’t say this lightly. I say this with a heavy heart and a troubled mind. But, you see, the thing is… I have had first hand experience with pandas. With a panda. And it was not pleasant. I was four years old, and that is long enough ago that I really shouldn’t be able to remember it, but I do. The entire episode is as clear to me now as it was then. One night when I was four, I had a nightmare, as children often do. I’m sure that I had many a nightmare at that age, many before and many since, come to that, but this one was so vivid, even though it made no sense in any way, that it’s never left me. 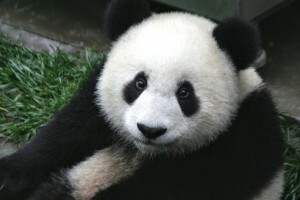 I awoke – in my dream – to find a giant panda sitting on my bed, watching me. 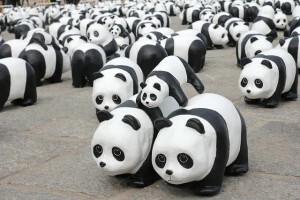 There was nothing unusual about this panda (apart from the fact that it was there in the first place). It wasn’t some demon creature, it didn’t have bulging red eyes or scales or horns, it wasn’t holding a knife or even baring its teeth. But it was terrifying. It didn’t blink. It barely moved. It just watched me, and the part that worried me the most was that I didn’t know how long it had been there before I woke up. Even at four that unnerved me. To think that it had been waiting for me, silently, patiently. I wanted to cry out for my mother, but I was too scared to make a sound. I wasn’t sure it knew I was awake. So I lay there, paralysed with fear, my heart slapping against my ribs, my eyes mostly closed but just open enough to watch the panda watching me. We stayed like that, the panda and I, for an eternity. And then, out of nowhere and for no discernible reason, the panda plucked a cigarette out of the air, lit it with an unseen match, and smoked it, right there, in my bedroom. On my bed. It’s large, furry rump nudging up against my stiff, sweating legs. Now the panda looked at me. It turned its head and stared into my eyes, smoke curling from its snout. It was angry. Its eyes narrowed and it hunched backwards. And then it was gone, I could feel its weight lifting from the mattress, and I saw it bolt. The dream becomes hazy after that. My mother appeared in the doorway and I think I must have woken up by then because she was really there. She remembers it still, remembers me calling out so pitifully, so quietly, and yet waking her anyway. But what she doesn’t remember, and what I can’t explain, is that she passed the panda on its way out. It ran out of the door as she ran in. She never saw it, but it saw her. It growled at her. She took its place on my bed and told me not to worry about it. It was just a dream, after all. Just a panda, and it was just smoking a cigarette. Nothing else. I believed her then. But in the morning I cried out for her again because in the dawn light I could see something that we had both overlooked the night before. There was a cigarette burn on my duvet cover. We still talk about it. Every now and then it comes up in conversation. And neither of us can explain it. I’ve been trying to exorcise that demon ever since. I don’t think I’ve quite made it yet.